Your dentists at Santa Rosa Dental Care in Santa Rosa, CA want to tell you the facts about porcelain veneers and why they are the state of the art way to improve your smile. 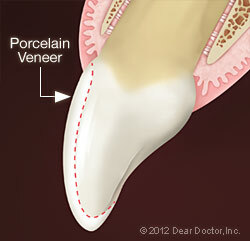 Porcelain veneers are natural-looking. They have a translucent quality that reflects light just like your natural teeth. They look delicate and beautiful, but they are durable, strong, and will last for many years. They are stain resistant, remaining sparkling white. They are the perfect choice for smokers and coffee drinkers who still want a white, beautiful smile. Porcelain veneer treatment is conservative because very little of precious tooth structure is removed to place the veneers. The first step in creating a new smile with porcelain veneers is to communicate exactly what you don't like about your smile with your Santa Rosa dentist. It's a great idea to bring in pictures of smiles you do like, as a starting point for discussion. It's possible to see how veneers would look on your teeth in one of several ways. A model of your teeth can be created over which wax “veneers” can be placed; sometimes acrylic (plastic) or tooth-colored filling material can be placed directly onto your teeth to demonstrate the effect veneers would have on them. Once the plan has been agreed upon between you and your Santa Rosa dentist, your teeth will be prepared by removing a small amount of enamel, if this step is necessary. Molds of your teeth will be taken and used by a skilled dental laboratory to create your veneers, and you will receive a temporary set of veneers to wear during the few weeks it will take to create your permanent veneers. 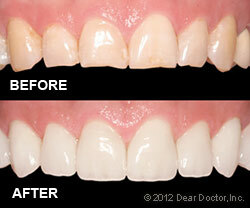 When the veneers come back from the lab, they will be cemented onto your teeth by your Santa Rosa dentist. Are you interested in getting custom dental veneers? Call Santa Rosa Dental Care in Santa Rosa, CA at (707) 921-1970 today!